There is one thing that I realized… it doesn’t matter where you go in the world there is always a dish that is a favourite in each country. Not everyone agrees on how that dish should be made now do they? Take Italy for a literal translation of this rule. Everyone has their own way to cook pizza or meat sauce and they all think they are right. 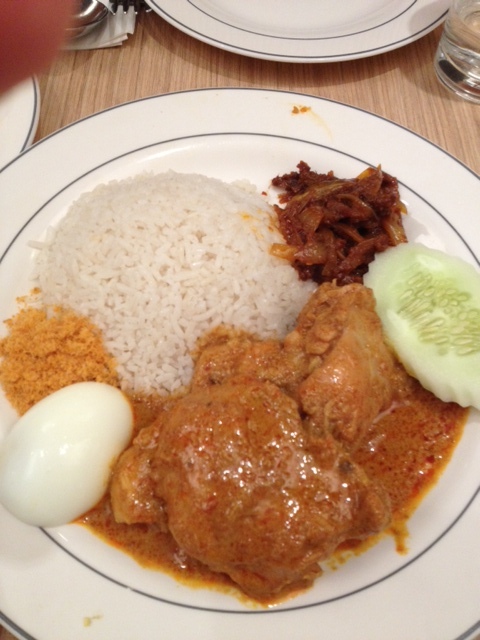 When I was in Malaysia recently I realized just how much I loved Nasi Lemak. I had it the week before I left at Petaling Street Malaysian Restaurant in Kingsford. I had it on the Air Asia flight over to Penang and I had it lots of times when I was there in Malaysia, and each time it was a little different. The things that remained the same were the coconut rice (in varying degrees of beauty, the boiled egg and the crispy anchovies (Ikan Balis) on the side. I figured I could do a quick version myself. 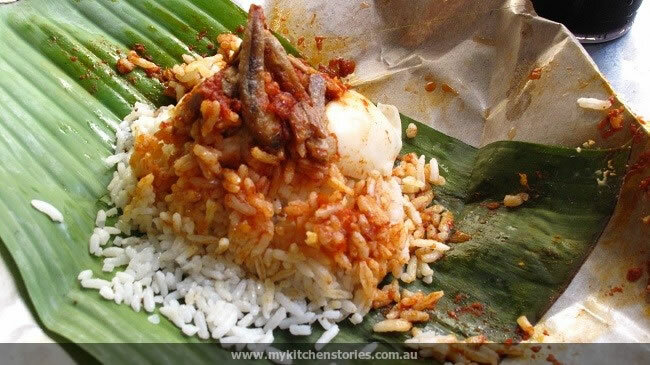 Nasi Lemak can be found every where all over Malaysia & Singapore, from a cafe in a shopping centre to a food stall on the street, at bus stops and train stations where it’s wrapped in Banana leaf and paper. It is universally loved. 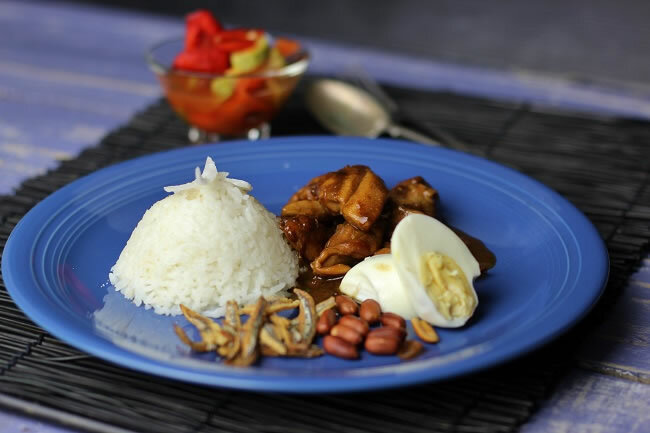 Nasi Lemak is coconut rice with sambal, peanuts anchovies and egg, but other things such as chicken curry or Rendang are also served with it. I made a cheats version of the curry that goes with Nasi Lemak using what I had in my cupboard. 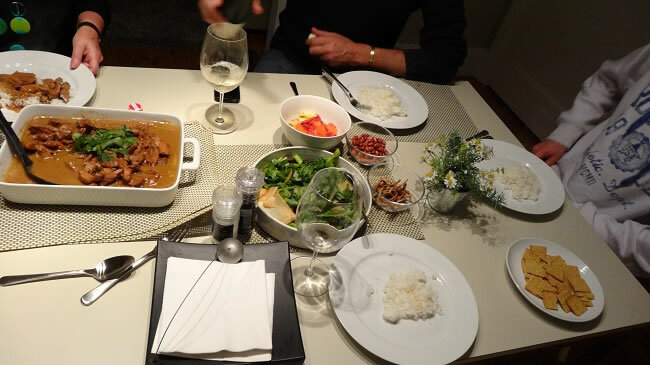 I know that Malaysians would not use green curry paste and I also didn’t have any tamarind, but this is a really great tasting curry and uses things you probably already have in the cupboard. To be honest I’d eat anything with coconut rice, it is just so good. This week Skaters Aunty visited from New Zealand. We don’t see her enough. We picked her up from the airport with champagne and drove her to he brothers house. 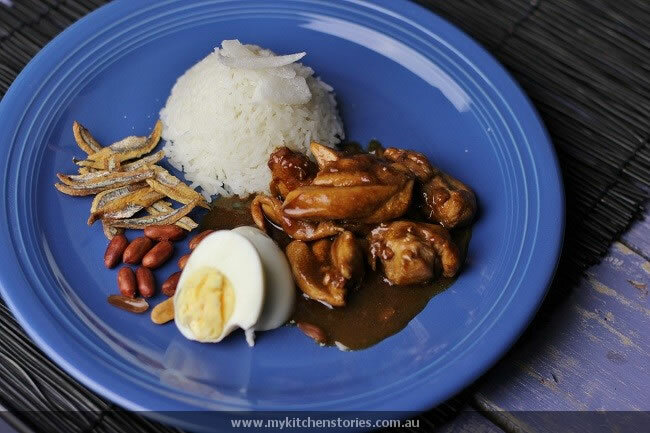 We took our version of Cheats Nasi Lemak with chicken curry with us, to reheat when we got there. 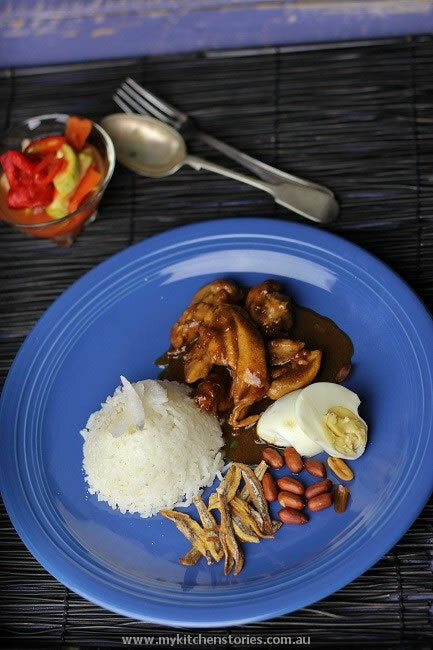 Coconut rice, chicken curry, boiled egg, peanuts, Ikan Balis and pickled vegetables. No banana leaves but it was still good. Give it a try. Don’t forget those crunchy little Ikan Balis. Crunchy peanuts are also an important part of this dish. I fried mine as well but you could buy freshly roasted unsalted ones from a hot nut stand. If you want to fry peanuts use small skin-on raw ones and put them into cold oil and bring it up to heat slowly until they are bubbling and frying and take them out before they get too coloured . They will keep cooking once drained, they are utterly delicious. 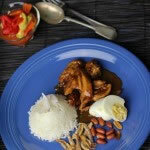 This is a classic Malaysian dish that you can make ahead. I used what I had on hand to make a chicken curry. Use your own favourite curry recipe if you like. Just don't skimp on the accompaniments. This recipe uses Australian cup measurements. Heat a medium pot with 2 tablespoons of oil. 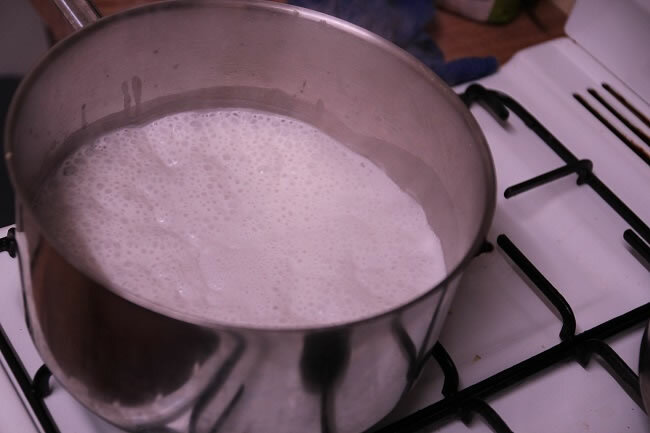 Add the coconut milk and cook over medium heat till it reduces and starts to colour and split. Add the onion, ginger, garlic and curry paste till soft and fragrant. 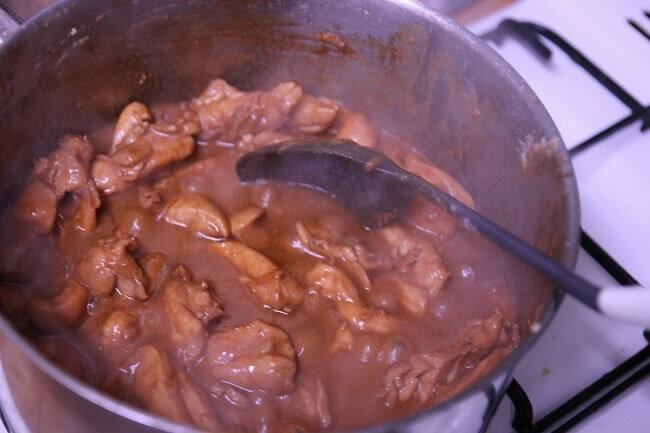 Stirring constantly then add the chicken pieces and stir till starting to turn white. Add the soy sauces and keep stirring. Simmer for 15 minutes on low. 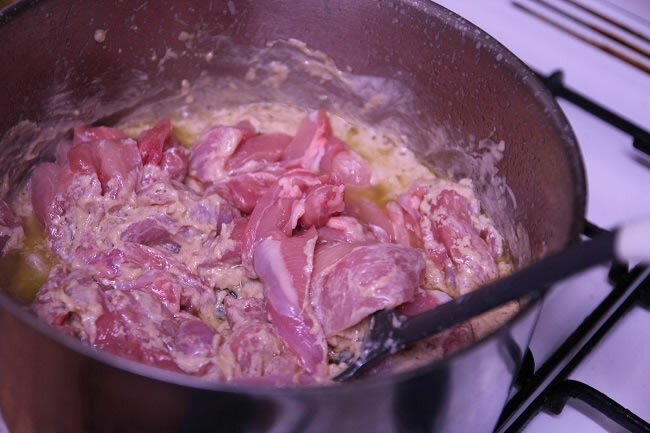 The chicken will start t to produce it's own sauce as it cooks. Taste for salt and add lemon juice and simmer for 5 more minutes or till cooked through. While this is cooking start on the rice. 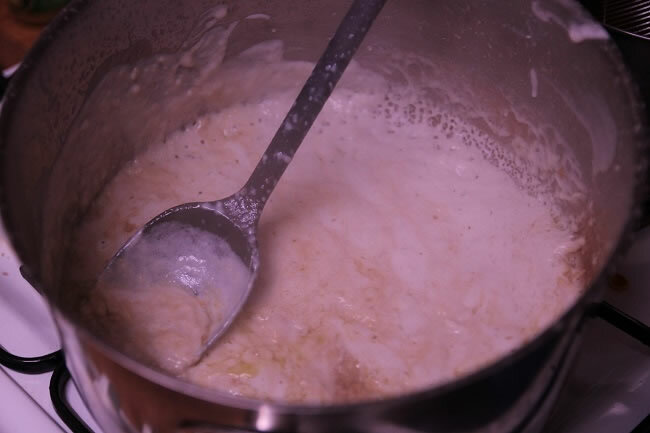 Use a rice cooker or cook on the stovetop. Rinse the rice in a colander and drain well. Put the rice and the coconut milk and water with the desiccated coconut into a pot with a small pinch of salt and stir well. Put on the lid and bring up to the boil making sure that you can see steam then turn right down & leave for 10 minutes. Turn off and let stand another 10 minutes without lifting the lid. The best thing is that this doesn’t look like a cheat’s version at all! 😀 love it! Tanya, you are amazing. I LOVE nasi lemak and you have me salivating all over my screen. Fried peanuts? Why have I never heard of them before? They sound rather dangerous! Heard about and seen nasi lemak a lot…esp. in those Malaysian bloggers….but I love your cheat version even more…those crispy anchovies are a winner. Looks fabulous Tania, I don’t blame you for having it 3 time in 2 weeks, when you’re onto a good thing, keep going!! Love the idea of the deep fried anchovies. Can you do this with regular anchovies or do they have to be Ikan Bilis? I have been missing these flavours so much!!! I will be making it tonight! !